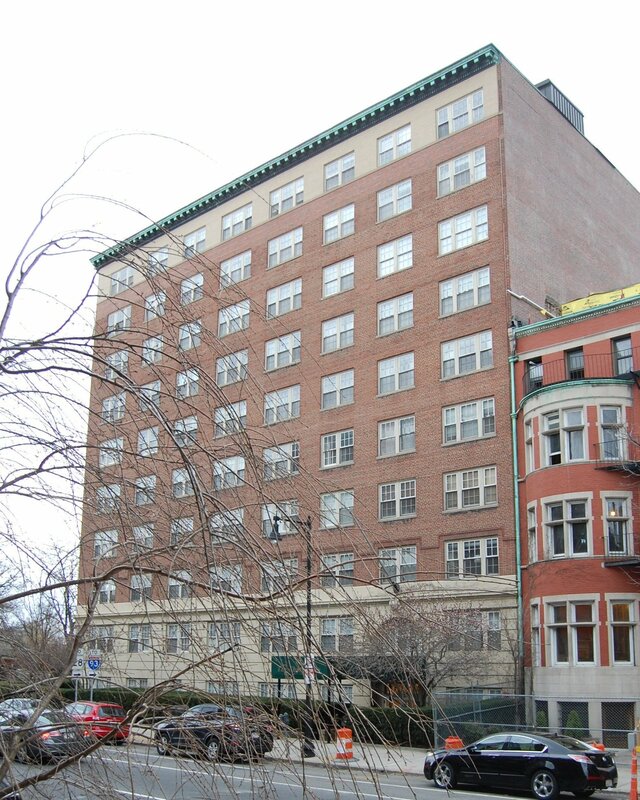 534 Beacon is located on the NE corner of Beacon and Charlesgate East, with 532 Beacon to the east and 4 Charlesgate East (535 Beacon) to the south, across Beacon. 534 Beacon (1 Charlesgate East) was designed by Edward B. Stratton, architect, and built in 1923-1924 by the F. J. Van Etten Company, builders, as The Fensgate (Hotel Fensgate) for the Fensgate Real Estate Trust. The Fensgate was built on a vacant lot at 534 Beacon and the site of 536 Beacon and 538 Beacon (1 Charlesgate East) at the northeast corner of Beacon and Charlesgate East. All three properties were acquired on May 1, 1923, by Daniel Cerussi, trustee of the Fensgate Real Estate Trust, from the Suburban Realty Corporation (Joseph Weeks, treasurer). Suburban Realty had acquired the properties on August 9, 1920, from the Boston Five Cents Savings Bank (conveyed by lawyer Irving Bertman), which had foreclosed mortgages it held on the properties and taken possession of them on July 16, 1920. Click here for an index to the deeds for 534 Beacon (1 Charlesgate East), and click here for an index to the deeds for the predecessor properties at 534-536-538 Beacon (Demolished). After acquiring the property, the Fensgate Real Estate Trust demolished the townhouses at 536 Beacon and 538 Beacon (1 Charlesgate East). The Fensgate Real Estate Trust financed construction of the building through the issuance of $450,000 in mortgage bonds, marketed by the Puritan Mortgage Corporation and secured by a trust indenture agreement with the State Street Trust Company as trustee. The Fensgate was completed in 1924 and the first residents were living there by the 1924-1925 winter season. On December 1, 1924, The Fensgate was purchased from the Fensgate Real Estate Trust by Lillian (Lili) M. Pinkul. She lived at 4 Leslie in Dorchester with her parents, Gustav Pinkel, an engineer, and Emma L. (Schwede) Pinkul. It appears likely that she owned the property on behalf of someone else. On May 26, 1925, the Suburban Realty Corporation foreclosed on a mortgage it held on The Fensgate and took possession of the property. In March of 1928, the hotel applied for (and subsequently received) permission to install an electric sign on the roof. In October of 1930, residents of the The Charlesgate, across the street at 535 Beacon, asked that the sign not be operated to flash on and off, and the hotel complied. The first mortgage on the property continued to be held by the owners of the bonds issued when the building was built, and on October 30, 1931, the State Street Trust Company, as trustee for the bondholders, foreclosed and transferred the property to attorney Alexander Whiteside. On the same day, he transferred the property to the Fensgate Corporation (C. G. Kuney, president). On January 1, 1932, the Fensgate Corporation issued $354,000 in mortgage bonds to finance its operations under a trust indenture with Alexander Whiteside as trustee. 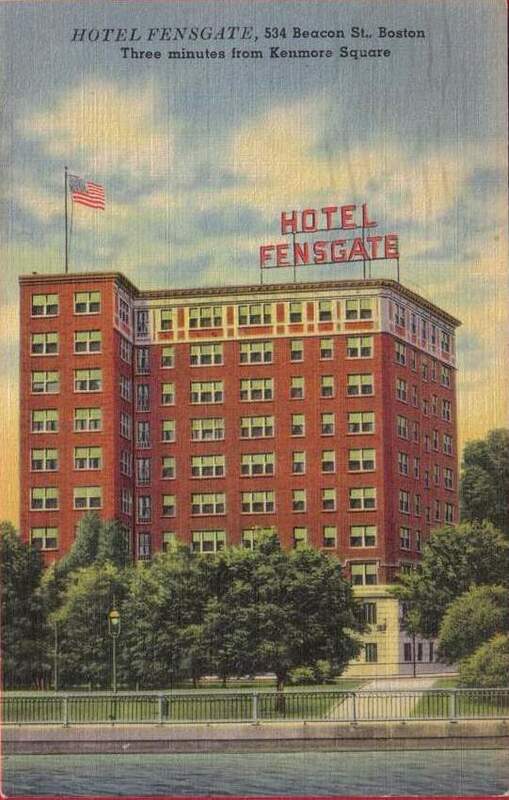 On June 8, 1934, Alexander Whiteside foreclosed on the mortgage and transferred the property to the Hotel Fensgate, Inc. The property subsequently went through bankruptcy with Alexander Whiteside acting as receiver, and on October 15, 1935, he conveyed the property to The Fensgate Company. By the mid-1930s, the Hotel Fensgate was operated by the Sheraton Hotel company, which also operated the Hotel Sheraton at 91 Bay State Road. In 1939, it entered into an agreement with Henderson Brothers to operate the Hotel Fensgate. On May 5, 1944, the property was acquired from the Fensgate Company by a newly organized Hotel Fensgate, Inc. 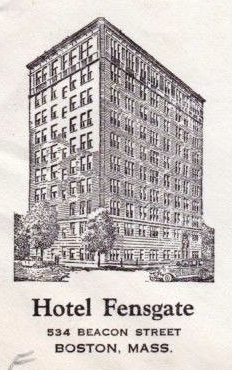 In reporting the sale, Boston Globe columnist Joseph F. Dinneen noted that, with the sale, management of the hotel would pass from the Henderson Brothers to Bernard Shepherd Snider “of the well-known Snyder [sic] hotel and theatre family.” He also noted that “Arki-Yavensonne will no longer be greeting the prominent and near-prominent in the Fensgate Hotel and the Satire Room.” In 1949, Arki-Yavensonne returned to Boston to become manager of the Oval Room at the Copley Plaza Hotel. 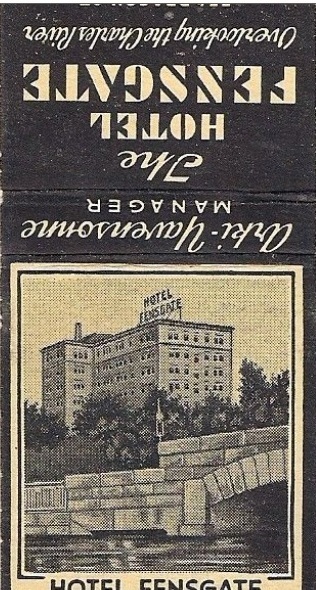 In August of 1945, the Fensgate Hotel applied for (and subsequently received) permission to construct a 50 foot x 78.5 foot dining room addition at the rear of the building. In the late 1940s, the hotel featured entertainment on an outdoor terrace, and in April of 1948 it was ordered by the Boston Licensing Board to have soft music only (no amplification) and to close by midnight as a result of complaints by MIT and Boston University students living nearby. By the early 1950s, the nightclub at the Fensgate was called the Café Society. In May of 1958, the Beacon Hotel Corporation entered into a longterm lease to operate the hotel. The property had changed hands during the 1940s and 1950s, and on June 30, 1961, it was acquired by the Chandler School for Women located at 448 Beacon. The property continued to be operated as a hotel until mid-1962, and thereafter was a dormitory and dining facility for Chandler School students. Chandler School did not obtain a change in the permitted use from a hotel to a dormitory. It did, however, receive licenses to operate the building as a dormitory from the Boston Licensing Board. Chandler School continued to operate 534 Beacon as a dormitory until about 1972. On June 15, 1971, Chandler Schools, Inc. (successor to the Chandler School for Women) transferred the property to the Chandler School Corporation, and on May 4, 1972, it sold the property to Rohrbough, Inc. George Irwin Rohrbough was president of Chandler School and his son, Malcolm Justin Rohrbough, was president and treasurer of Rohrbough, Inc. In 1973, 534 Beacon was used as a dormitory and dining facility by Boston University. On August 23, 1973, 534 Beacon was acquired from Rohrbough, Inc., by Emerson College, which used the property as a dormitory. In February of 1976, the Building Department cited Emerson College for operating dormitory at 534 Beacon without obtaining a change in legal occupancy to permit that use. Emerson College subsequently filed for permission to change the use from a hotel to a dormitory. Residents of the neighborhood expressed concern about the continued use of the building as a dormitory, and the Board of Appeal imposed a series of conditions, postponing a final decision until the early 1980s, when it approved the use. Emerson College continued to operate a dormitory at 534 Beacon until the mid-1990s. On June 28, 1995, 534 Beacon was acquired from Emerson College by the 534 Beacon Street Limited Partnership, the general partner of which was the Raymond Cattle Company operated by real estate developer Neil St. John (Ted) Raymond. In July of 1995, the 534 Beacon Street LP filed for (and subsequently received) permission to remodel the building (including removing two one-story additions at the front and rear of the building) and to convert it into 67 apartments (57 one bedroom units and 10 two bedroom units). In September of 1995, it filed for (and subsequently received) permission to change the legal use from a dormitory to 67 apartments. 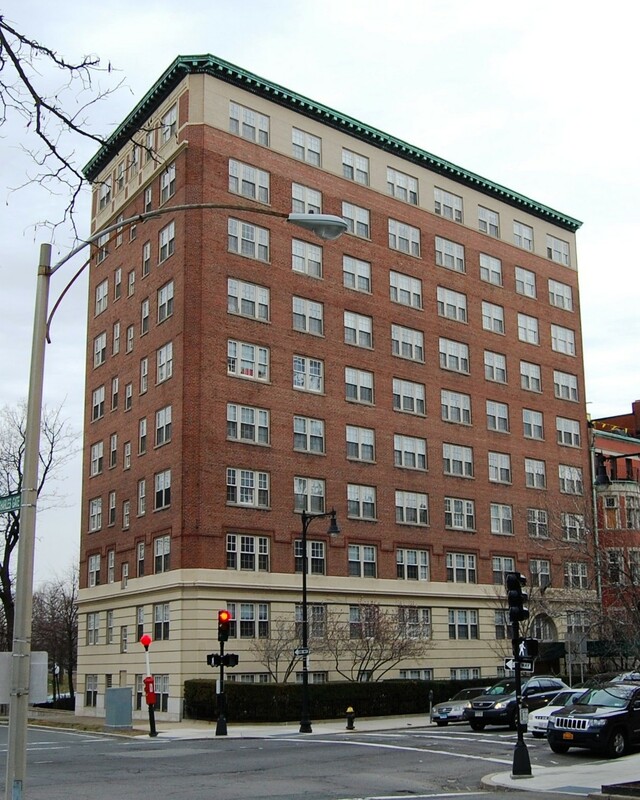 On October 31, 2001, the Charlesview Realty LLC, successor to the 534 Beacon Street LP, converted the apartments into 67 condominium units, The Charlesview Condominium. 536-538 Beacon were designed by William York Peters and built ca. 1891, 536 Beacon for George Zacharias Silsbee and 538 Beacon for Dr. William Sohier Bryant. The houses were built on land originally purchased on June 2, 1887, from the Boston and Roxbury Mill Corporation by Elizabeth Perkins (Cabot) Lee, the wife of Henry Lee. They lived in Brookline. The original parcel had a frontage of 120.18 feet. 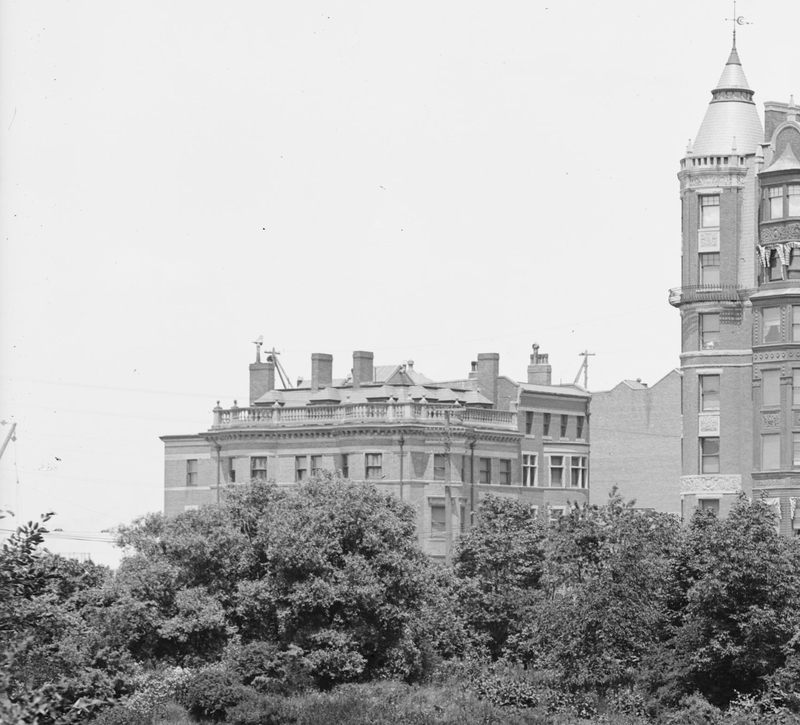 On November 25, 1887, she transferred a strip 10.54 feet wide at the western edge back to the Boston and Roxbury Mill Corporation, with the stipulation that it was to be used only for “a public park, parkway, or highway.” The land subsequently was used as part of the extension of Charlesgate East from Beacon to Back Street. On December 13, 1887, she acquired a 6 foot strip on the east from Dudley Leavitt Pickman (the western part of a 56 foot lot he had purchased from the Boston and Roxbury Mill Corporation, also on June 2, 1887). Click here for an index to the deeds for 534-536-538 Beacon (Demolished). 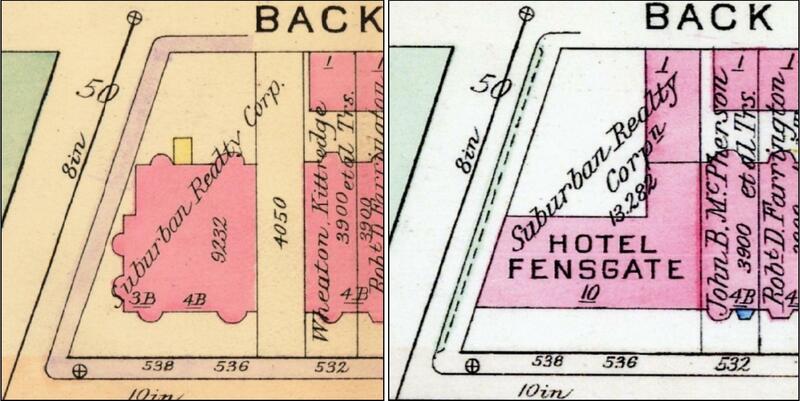 On February 14, 1890, William Bryant purchased the corner lot, with a frontage of 60.64 feet on Beacon from Elizabeth Lee, and on March 25, 1890, George Z. Silsbee purchased the lot at 536 Beacon, with a frontage of 26 feet, from her. She retained the vacant lot at 534 Beacon. On February 24, 1890, the owners of all of the land on the north side of Beacon between Massachusetts Avenue and Charlesgate East entered into an agreement limiting (until January 1, 1905) the depth of any new buildings to 90 feet from the north line of Beacon (with bays and other projections limited to extending another 5 feet), and limiting the height of stables and other ancillary buildings further north to no more than 12 feet in height. The agreement probably was prompted by construction of The Austerfield at 7-9 Massachusetts Avenue (502 Beacon). It was the only building on the block and its north façade extended to Back Street. 536 Beacon was completed by the 1891-1892 winter season and George Z. Silsbee had made it his home. A retired East India shipping merchant, he previously had lived in Beverly. He was a widower, his wife, Elizabeth Sanders Saltonstall, having died in August of 1887. George Silsbee died in September of 1895 and 536 Beacon was inherited by his three children: George Saltonstall Silsbee, Katharine E. Silsbee, and Francis B. Silsbee. 536 Beacon was not listed in the 1896 and 1897 Blue Books. On May 25/26, 1897, 536 Beacon was acquired from George Z. Silsbee’s heirs by Francis William Kittredge. He and his wife, Mary Hascal (Wheaton) Kittredge, made it their home. They previously had lived at 144 Warren in Roxbury. On August 14, 1897, he transferred the property into his wife’s name. The Kittredges continued to live at 536 Beacon during the 1899-1900 winter season, after which they moved to a new home they had built at 532 Beacon. 538 Beacon (1 Charlesgate East) was completed by the 1892-1893 winter season and William S. Bryant and his wife, Martha (Cox) Bryant, had made it their home. They previously had lived at 111 Beacon. They also maintained a home in Cohasset. William Bryant was a physician and aural surgeon. The Bryants continued to live at 538 Beacon (1 Charlesgate East) during the 1895-1896 winter season, but moved thereafter to Brookline. He continued to own the property and lease it to others. During the 1897-1898 winter season, 538 Beacon (1 Charlesgate East) was the home of dry goods merchant Francis Wright Fabyan and his wife, Edith (Westcott) Fabyan. They had lived at 169 Commonwealth during the previous season, and by the 1898-1899 season were living at 232 Beacon. 536-538 Beacon were purchased on July 12, 1899, by Thomas William Lawson, 536 Beacon from Mary Kittredge and 538 Beacon (1 Charlesgate East) from William S. Bryant. At the same time, he also acquired the vacant lot at 534 Beacon from Elizabeth Lee, with a 29 foot frontage, and transferred the eastern two feet to Mary Kittredge, who lived at 532 Beacon. The deed from Elizabeth Lee to Thomas Lawson included language extending until January 1, 1930, the restrictions contained in the 1890 agreement limiting the depth of any building built on the land and the height of any structure built in the rear of the property. Thomas Lawson and his wife, Jeannie Augusta (Goodwillie) Lawson, purchased the property with the intention of demolishing the existing buildings and building a new home. Thomas Lawson was an investor and financier specializing in mining stocks. In 1899, he was an organizer of the Amalgamated Copper Mining Company, which later became the Anaconda Copper Company. He also was an author of both non-fiction and fiction, and an unsuccessful independent candidate for US Senate in 1918. 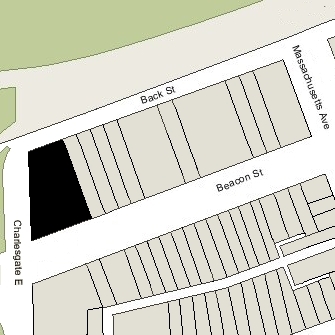 Based on the Bromley maps, it appears that the Lawsons did not demolish 536 Beacon and 1 Charlesgate East, but rather combined the existing houses, with the address of 1 Charlesgate East (shown as 2 Charlesgate East in the 1899-1905 Blue Books), leaving the lot at 534 Beacon vacant. The change in plans may have reflected the Lawsons’ focus on building their summer home, Dreamwold, located on 210 acres at Egypt in Scituate, on which construction began in 1901. On April 28, 1902, Thomas Lawson transferred 1 Charlesgate East and 536 Beacon into his wife’s name, and on October 15, 1902, he transferred the vacant lot at 534 Beacon to her. Jeannie Lawson died in August of 1906. Thomas Lawson continued to live at 1 Charlesgate East and in Scituate until the early 1920s. He faced increasing financial reverses, and on July 16, 1920, the Boston Five Cents Savings Bank foreclosed on its mortgage and took possession of the property. In the fall of 1922, his Dreamwold estate was sold for the benefit of his creditors. On August 9, 1920, 534-536-538 Beacon were acquired by the Suburban Realty Corporation. On May 1, 1923, the property was acquired from Suburban Realty by the Fensgate Real Estate Trust, which razed the buildings and built The Fensgate on the land.